These are socks worth gossiping about! Their simple structure is offset by two panels of ladylike texture on either side of the leg. 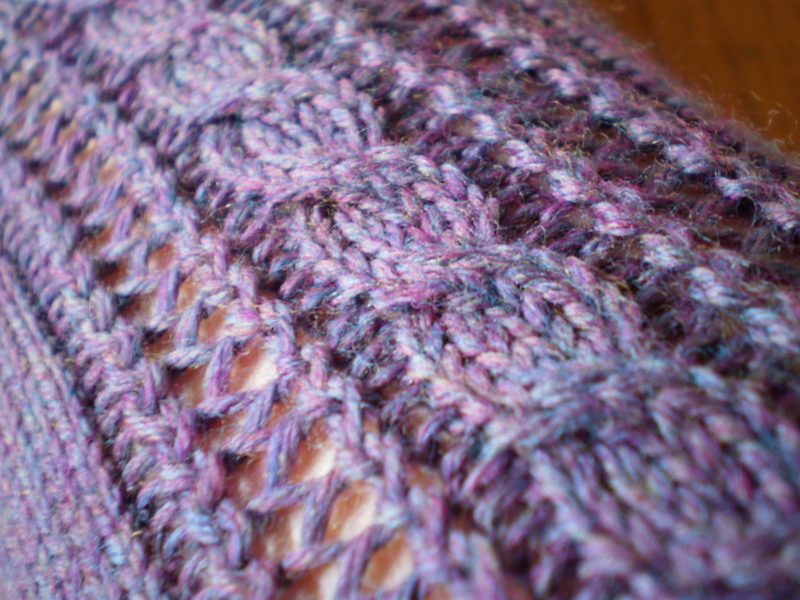 Two grapey cables run between trellises of delicate openwork, making a sock that looks intricate, but is very simple to work up. A delight to knit, and a pleasure to wear, the grapevine will be talking about these socks for years to come! The Through the Grapevine Socks are knit on size 2 double-point needles using Knit Picks Stroll yarn (or your favorite brand of sock-weight yarn), in women’s size Small-Medium or Medium-Large. They are worked from the 1×1 ribbed cuff down to the toe. The heel is made using standard heel-flap construction, and the toe is created with sets of decreases on either side of the foot and closed up with the Kitchener stitch. If you have difficulty with sock construction, please see my pattern “Socks by the Numbers” for more information. This entry was posted in Patterns and tagged cable, eyelet, grapevine, heel flap, openwork, pattern, sock, sock pattern, socks, through the grapevine socks, top-down on January 27, 2014 by onemilljellybeans.